The definition of a cloud: tiny water droplets or ice crystals that settle on dust particles in the atmosphere. Would you consider this a cloud? What kind of cloud is it? Do you think it looks like a cloud? 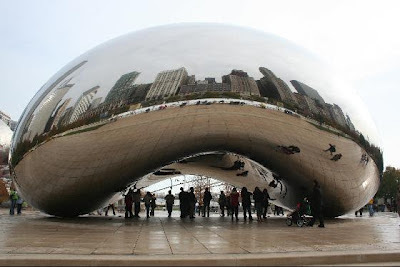 What would you name this sculpture by Anish Kapoor? How does the cloud feel? Would you be able to see your reflection in a cloud? Perhaps. You can see your reflection in puddles, why not a cloud. Do you see the tiny particle of dust with the water droplet is sitting on its back? Draw your own water droplet or ice crystal stuck to tiny dust particles. The droplet is definitely stuck to the tiny dust particle! This is how I imagine it looks like inside a cloud. What do you think it looks like inside a cloud? What does it feel like inside a cloud? Don't forget to enter my giveaway! It ends July 31st.